At a time when the need for antibiotics is high, pharmaceutical companies are abandoning antibiotics development in favor of larger, more predictable markets. That has been the situation for the past few years, and it isn’t changing, according to Aaron S. Kesselheim, M.D., J.D., associate physician at Brigham and Women’s Hospital, and assistant professor of medicine at Harvard Medical School. Yet, with the incidence of antibiotic resistance growing, there is an acute need for new, more effective targets. The Infectious Diseases Society of America (IDSA) reports that only two new antibiotics for gram-negative bacterial infections have been approved since 2009, and fewer than 10 are in Phase II/III development. Of those, only a handful are active against bacteria that produce metallo-b-lactamases, which are important determinants of resistance. Market research company Global Information, Inc. (GII) estimates the cost of hospital-acquired infections alone at $32.5 billion for the United States, the European Union, Canada, Australia, and Japan—–about $25 for every person living in those regions. Of the 109 antibiotics that it identified in the pipeline last winter, approximately 70% were in the Phase I or preclinical stage, and only 9 candidates (roughly 8%) were in Phase III. GII identified 66 companies involved in antibiotics research. Of those, 86% were small to medium-sized enterprises. Of more immediate note, the U.S. Department of Health and Human Services (HHS) signaled a policy change in May when it awarded funds to GlaxoSmithKline in a way that allows the company to shift funds around its antibiotic programs. This is the first time HHS has taken a portfolio approach to its grants and contracts. With this flexibility, GlaxoSmithKline has the incentive to develop the most promising antibiotic candidates rather than those that are funded, thus allowing progress in a way that acknowledges the fluctuations of scientific advances and failures. This also allows compounds to be investigated as treatments for conventional and biothreat pathogens. Regulators are beginning to consider ways to address antibiotic resistance. “We’re seeing policy and regulatory changes to encourage development of new antibiotics for resistant bacteria on both sides of the Atlantic,” noted Michael Bonney, CEO of Cubist Pharmaceuticals. For example, the Generating Antibiotic Incentives Now (GAIN) Act was signed into law in July 2012, and the FDA has issued guidance documents on complicated urinary tract infections (cUTIs) and complicated intra-abdominal infections (cIAIs), among others, that are considered significant. In June, U.S. Senator Diane Feinstein (D-CA) introduced the Preventing Antibiotic Resistance Act (S. 1256). The bill limits the non-routine use of important antimicrobials in animal production in an attempt to reduce the antibiotics found in the natural environment and in foods, and thereby slow the proliferation of drug-resistant bacteria. It was referred to the Senate Committee on Health, Education, Labor, and Pensions, and is similar to H.R.1150 in the U.S. House of Representatives. The bulk of the work in antibiotics is being done by small biotech companies, according to IDSA. At newly formed Enbiotix, J. Ruben Morones-Ramirez, Ph.D., professor at Universidad Autónoma de Nuevo León, James J. Collins, Ph.D., and other scientists are showing that the addition of silver to standard antibiotics targeting gram-negative bacteria improves their efficacy between 100- and 1,000-fold. “This is the first work to biochemically and genetically decipher the mechanisms by which silver treatment led to cell death,” said Dr. Morones-Ramirez. Lab work shows that this approach enhances existing antibiotics, broadens the spectrum of vancomycin, and helps resensitize resistant bacterial strains. “We’ve been approached by some pharmaceutical companies, such as Cubist Pharmaceuticals and Pfizer, that are interested in our work. We believe the technology of adding silver to antibiotic therapies will be explored much further and has a very nice shot at being successfully implemented as a therapeutic in approximately five years,” continued Dr. Morones-Ramirez. The next stage of the company’s work will be to explore silver toxicity in higher organisms (that is, sheep) to move quickly into human trials. Dr. Morones-Ramirez’s university laboratory is exploring nanotechnology as well as synthetic and systems biology to develop intelligent delivery systems and to design therapeutics that decrease toxicity and possible side effects from the antibiotics, silver, and their combinations to enable faster commercialization. Cubist Pharmaceuticals, since its founding in 1992, has focused on the acute care hospital environment and maintained a strong interest in antibiotics. “Antibacterials will be an important part of our future,” said Bonney. Currently ceftolozane/tazobactam (CXA-201) is undergoing Phase III trials for cUTIs and cIAIs. Cubist also is planning a Phase III program for ceftolozane/tazobactam in hospital-acquired/ventilator-associated bacterial pneumonia. That drug targets gram-negative bacteria. “Pseudomonas aeruginosa is high on that [gram-negative target] list,” according to Bonney. The FDA granted fast-track status for all three indications. Surotomycin (CB-315), an oral lipopeptide, is in Phase III for Clostridium difficile-associated diarrhea. “C. difficile is the number-one bacterial threat in the United States. Globally, it accounts for approximately 30 million days of treatment per year,” he continued, adding that Cubist expects to file an NDA in 2015. In July, Tetraphase was granted the Qualified Infectious Disease Product (QIDP) designation for eravacycline (TP-434) in cIAIs and cUTIs. This designation enables priority review and eligibility for fast-track status, as well as the potential for a five-year extension of patent exclusivity. The antibiotic is in Phase III trials for cUTIs. This synthetic, intravenously administered tetracycline is a broad-spectrum antibiotic for multidrug-resistant infections. Additional compounds are in preclinical development. The company also is working to create oral antibiotics. Achaogen is focused on multi-drug-resistant, gram-negative bacterial infections. In April, it was awarded a $60 million contract from the Biomedical Advanced Research and Development Authority (BARDA). The funds will be used to conduct a global Phase III study to evaluate the safety and efficacy of plazomicin for patients with gram-negative bacterial infections caused by carbapenem-resistant Enterobacteriaceae (CRE). The study is scheduled to begin during the fourth quarter of 2013. Plazomicin (ACHN-490) is a next-generation neoglycoside that has demonstrated efficacy against many pathogens. 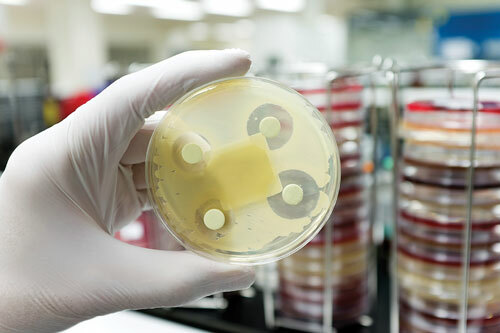 AstraZeneca’s ceftaroline/avibactam (CAZ104) is in Phase II studies for cUTIs and cIAIs, and early results indicate potency against MRSA and enterobacteriaceae in vitro. This β-lactamase inhibitor, combined with cephalosporin, is expected to launch in the European Union and Japan the second half of 2014 and in China in 2016. Zinforo, an extended-spectrum ceftaroline for pneumonia and skin infections, already has launched in Europe and is expected to launch in China in the first half of 2014. Merck has two antibiotic programs in Phase III and five in Phase II development. In Phase III trials, actoxumab/bezlotoxumab (MK-3415A) combines antibodies targeting two C. difficile pathogenic toxins (A and B). Merck is developing it with Massachusetts Biological Laboratories and Medarex. Also in Phase III is Merck’s vaniprevir (MK-7009), which is being developed as an oral NS3/4A protease inhibitor in combination with pegylated interferon alfa-2b (peg-IFN alfa-2b) and ribavirin (RBV) in a clinical trial of Japanese, treatment-naïve participants with chronic hepatitis C genotype 1. Merck’s Phase II projects include antibiotics for hepatitis C, HIV, human cytomegalovirus (HCMV) infection in transplant patients, and acute bacterial infections. GlaxoSmithKline has one antibiotic in a Phase III trial, three in Phase II trials, and two in Phase I trials. Four of the six compounds were in-licensed or developed through collaborations. Relenza, an intravenous neuraminidase inhibitor for influenza, is the most advanced. The targets of the Phase II antibiotics are listed as malaria, hepatitis C, and bacterial infections. The Phase I targets are also listed simply as bacterial infections. In May, GlaxoSmithKline was awarded $40 million from HHS for an 18-month agreement, and up to $200 million if the program is renewed for five years. Second Genome is taking a nonantibiotic approach to treating infection, said Peter DiLaura, CEO. The company is developing microbiome modulators to promote the growth of commensal bacteria, focusing around inflammation, metabolic disease, and hospital-acquired infections. “We have built a platform to look at this microbial interaction and are conducting preclinical research on these areas,” he explained. Early results suggest that modulating the gut microbiome may reduce the length of time the body is susceptible to C. difficile infection, and that a healthy microbiome may promote the growth of commensal bacteria to prevent or fight C. difficile infections.